A Shine speciality! Heated between 85 and 90 degrees, this is our most invigorating class. Set to upbeat music, this thoughtful flow series will challenge you and encourage you. With every breath you’re vibration will get higher and your smiler bigger. This is an experience. Modifications will be offered throughout the class for both beginners and more advanced yogis. You will leave class sweatier … happier … stronger … and shinier. Heated to a comfortable room temperature, this gentle and slow-moving class includes mostly floor postures and encourages relaxation and deep stretching. Each pose is held for about 15-20 breaths. Yin Yoga applies gentle tension to the connective tissue, such as the tendons, fascia, and ligaments with the aim of increasing circulation in the joints and improving flexibility and strength. The poses also improve the flow of prana (life force) to boost organ health, immunity, mental and emotional balance and well-being. Appropriate for all levels. This flow class focuses on deep stretching and mindfulness. Feel Good Flow is appropriate for all levels. Join us for this feel good class that will leave you feeling relaxed, recharged and inspired. You can also expect flowy, gentle sequences that encourage you to give the mind a break and tune into your body and breath. Take this class and you will leave FEELING GOOD. No previous yoga experience necessary. Join us for this fun and challenging pilates- style exercise class with weights! We offer 1, 2, 3 and 5 pound weights in this class and it's for every level. The class is 60-minutes and it's a sweaty one; get ready to be challenged! Each teacher has a different style so each class promises something new and exciting! This class is heated to a comfortable temperature. A special flow class dedicated to honoring your body, mind and spirit through connection. This gentle class is not heated though the temperature will rise naturally as more bodies fill the studio. Designed for every yogi no matter your skill level, this class encourages you to deepen and strengthen your practice. You will learn the fundamentals of the vinyasa flow practice including how to align your body, properly breathe and more, all while focusing on connecting to your highest self. We recommend this class for those yogis who want to learn more about their practice and themselves. This heated flow class is fluid and calming. This class is appropriate for all levels and can be modified to your needs. Use this class to relax your mind, move your body and escape for a bit. Connecting your movements with your breath in this class will allow you to get deeper into your poses and nourish your body, mind and soul. We call this class "vinny" as it combines both vinyasa and yin disciplines and is slower but challenging. Get ready to stretch and SHINE with this feel good class! You'll start with a warm up and sequence of upper-body exercises, which include free weights, push-ups, planks and moves that target the biceps, triceps, chest and back muscles. Next, you'll use the ballet barre and your own bodyweight for resistance to focus on the thighs and seat muscles. Barre is a head-to-toe workout for every body type. Combining forms of pilates, yoga, dance and functional training, this workout will leave you feeling toned, slimmed and strengthened. Restorative Yoga will quite literally calm your entire being. 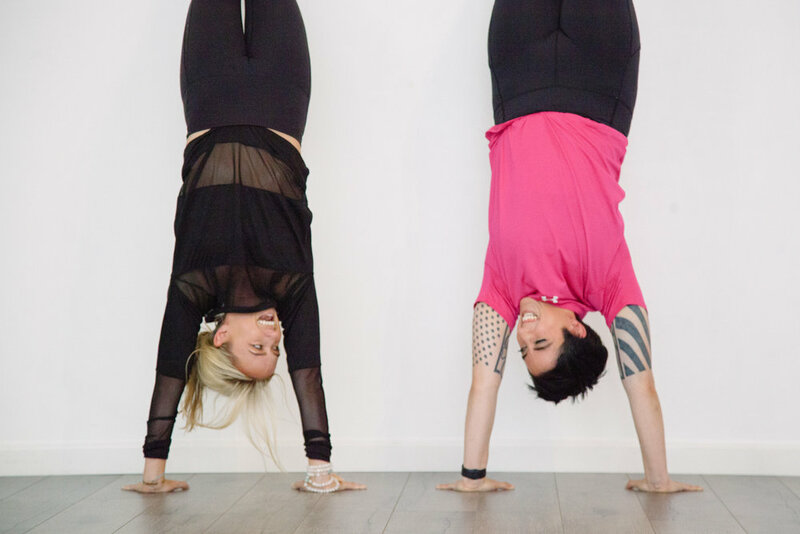 This tranquil non-heated practice involves props to support you and guide you into postures. Practiced in a candlelit room, this practice encourages you to explore your body, heighten your awareness and deepen the connection with yourself. You will leave our evening restorative classes feeling balanced, relaxed and ready for a wonderful night's sleep.